Ketchum Lighting’s showroom offers a wide selection of lighting fixtures, which are carefully handpicked for fine craftsmanship, innovative use of technology, and inspired, exceptional design. 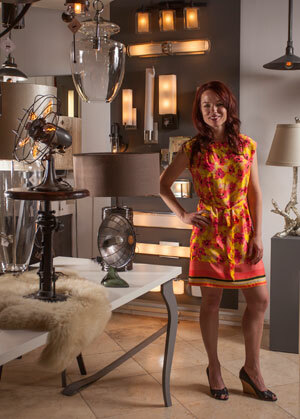 Ketchum Lighting works on residential and commercial projects both locally and out of state. I am really excited about the fact that we have just made almost all of our products available online, which allows our customers to shop Ketchum Lighting from basically anywhere. I graduated in 2006 from the University of Minnesota with a degree in architecture and prior to owning Ketchum Lighting, I was a designer and a buyer for a locally-owned chain of boutiques in Salt Lake City that specialized in home décor and accessories. When did you know that you wanted to go into this field and what motivated you? I decided to study architecture because I love design and it was a great outlet for me creatively, but I quickly discovered that what I was truly passionate about was how people live and how design can impact and enrich their lives. Lighting was a natural fit because very few things can impact a space as much, and as profoundly, as lighting. When I couldn’t find what I needed for client jobs, I began manufacturing it myself. Being around creative, passionate people and watching them work inspires me. This is one reason that I love being in the Wood River Valley. This valley is full of exceptionally talented craftsman and designers who are producing amazing work, and I am inspired every time I get to collaborate and bring my expertise to one of these projects. Describe your process–how do you work with clients, contractors, designers, and architects? Lighting design is about creating focal points and enhancing areas while providing function and creating moods. I work with clients both on-site and in my showroom to achieve not only the overall aesthetic that they are looking for, but also to ensure that the quality and quantity of light that is provided maximizes the full potential of the space. There are literally tens of thousands of lighting fixtures available to our customers, a fact that can be overwhelming. We pride ourselves on having a vast knowledge of not only what is available, but more specifically, what is exceptional. Ketchum Lighting is an excellent resource; we help our customers narrow down their options ensuring that they get exactly the lighting fixture that they are looking for at the best possible price. Do you have favorite products you prefer or are kbown for? I pride myself on having a showroom that is small but meticulously curated. I love finding unique fixtures that you won’t see anywhere else. I have a woman in San Francisco who makes hand-blown glass pendants, and a guy out of Austin who upcycles vintage appliances into new lights. I also have a weak spot for fantastic design that doesn’t cost a fortune. I know it sounds counter intuitive as a business owner, but I love having some lighting options in my showroom that are on trend and stylish with a price tag that isn’t going to leave you breathless. I would have to say my first trip to Las Vegas a couple of years ago. I always thought that I wasn’t a Vegas kind of girl, and boy, was I wrong! It must have been all the lights. Yep, it was definitely the lighting that won me over. Your home should be a unique space that is defined by your individuality. Our large selection of one-of-a-kind dining tables, coffee tables, consoles, and custom upholstery ensures that your home is your own inviting environment. We are obsessed right now with menswear-inspired tweed fabrics and are fervent believers in mixing thrift with couture. I started in the San Francisco Bay area where I had a reputation for creating amazing environments for wine tasting rooms with our custom tables, bars, and islands, which also could be used in residential spaces. Our custom upholstery has been featured on several television shows and can be produced in three to four weeks. I would work with animal rescue in some capacity. A few years ago, I had the opportunity to tour Best Friends in Kanab and fell in love with their philosophy; I would want to do something to save the many animals in need. I find Singapore to be the most amazing place on earth. It has a clean simplicity that I adore in the people, the streets, and the architecture, and a sense of unspoken respect. What do you enjoy most about living and working where you do? Since moving to Utah recently from San Francisco, I am discovering every inch of Utah that I can. I am fascinated with the fall leaves and hiking in Mill Creek Canyon and want to explore every inch of Moab and the many majestic national parks in Southern Utah. Ketchum Lighting has been creating beautifully lit spaces in the Wood River Valley for close to a decade. Heidi Titus purchased the business in 2013 and, with a background in design and architecture, is taking the company in exciting new directions. With a new location and a redesigned showroom, the team at Ketchum Lighting is poised to provide a great local resource to the area’s residents.